Creating an entrepreneurial ecosystem is a topic that resonates with communities throughout the state. Annette Weeks, Director of the Center for Entrepreneurship, has recently visited several communities speaking about efforts to cultivate and strengthen startup businesses. Weeks spoke to the Lebanon, Missouri Rotary where more than 50 leaders and community members gathered for their weekly meeting. Weeks reviewed the number of business in Laclede County in comparison to other similar-sized counties. Those gathered were very surprised at the percent of businesses that were under 10 employees. “We appreciated Annette’s presentation. It was very informative and a topic that really should resonate in a town like Lebanon, where we hope to grow and cultivate small business owners,” said Dr. Dusty Childress, Executive Dean of OTC Education Centers. 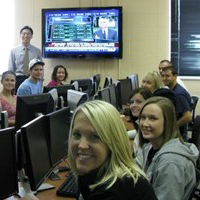 The Center for Entrepreneurship is a division of the Missouri Western State University Steven L. Craig School of Business designed to provide business support to community members.